Set up by Liz Mair in 2011, an experienced health and local authority commissioner and health professional, MAIR HEALTH ensures the right people with the right skills are involved in project delivery. This ensures projects are delivered successfully with energy, agility and client focus, building on our reputation of doing what we say we will do. After over 25 years working in a variety of roles in the NHS, Liz left in March 2011 to set up MAIR HEALTH. Her final role in the NHS was as the commissioner of Child and Adolescent Mental Health Services (CAMHS) for Leicester, Leicestershire and Rutland. This involved planning and buying a range of mental health services across health, local authority and voluntary sectors and developing a CAMHS strategy for 2011 to 14. This strategy was based on the views of children, young people and families. From 2004 to 2008 she delivered health improvement programmes across Leicestershire and Rutland, focussing on mental health, substance misuse and the health of prisoners. Liz is also a clinician with a range of skills relating to the provision of health services. She worked as a health visitor for ten years and before that as a children’s nurse. She has maintained her registration and still works clinically. 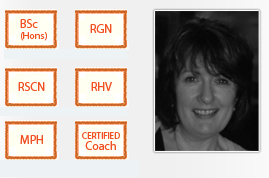 In 2006 she became a qualified coach and has worked as a personal and executive coach since then. She has obtained qualifications from Hull University, Leeds University, Great Ormond Street and The University of Bedfordshire. Sara of Mair Education is a museum learning specialist, audience development consultant and researcher trained to Market Research Society standards. Adam is a business marketing advisor and service analyst. He works on a free-lance basis. Before leaving the NHS to work in industry, Adam had interim project support and administrative roles in the Children and Families Commissioning Team at NHS Leicester City and Francis Dixon Lodge, Leicestershire Partnership Trust. · Support to translate the specification into measurable KPIs and advice on ‘clawback’ and performance thresholds. “Liz is really approachable and friendly and has been a great support. She is good at making you feel at ease”. Public sector service development and improvement.